NOTE: These instructions will take you away from this page as you go into App Inventor. Be sure to come back and follow the Step 4 instructions for connecting to a device or emulator. 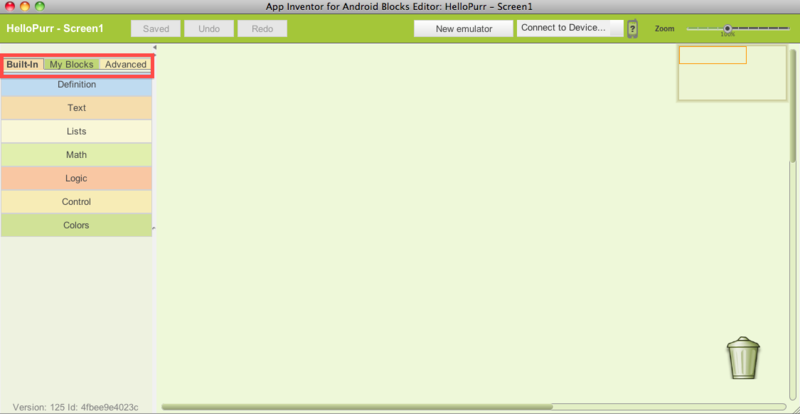 In your web browser, go to the App Inventor website at http://beta.appinventor.mit.edu/. 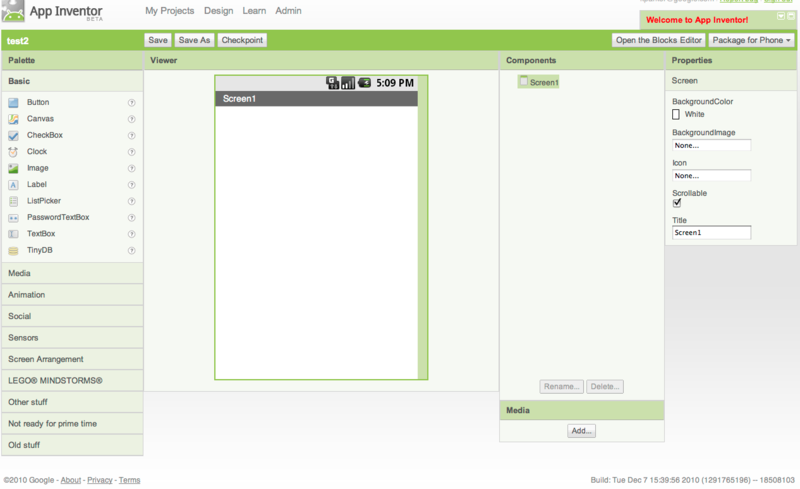 If this is the first time you are using App Inventor, you will see a blank projects page. Click New on the left side, near the top of the page. Enter the project name HelloPurr (one word, with no spaces) in the dialog box that appears, then click OK. In addition to the Designer, you need to start the Blocks Editor, the place were you set the behavior of the app. It is a separate application with its own window, and therefore we need to open two windows to design an app. These windows are linked: changes made in the Designer will be immediately reflected in the Blocks Editor. When you click Open the blocks editor from the Designer window, the Blocks Editor program file should download and run. The large empty "canvas" space on the right side is referred as the work area, in which you place blocks to assemble the program. On the left side, it has three palettes (Built-In, My Blocks, Advanced); each palette has drawers storing sets of blocks. When you click a drawer, you can see all the blocks stored in that drawer. You can scroll down to see more blocks. The Built-In palette contains the standard set of blocks that are available for every app you build (e.g., Definition, Text, Lists etc.). 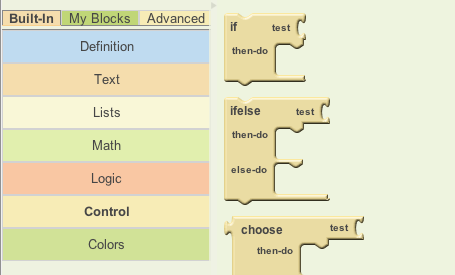 The blocks under the My Blocks palette contains specific blocks that are tied to the set of components that you have chosen for your app. The Advanced palette contains blocks for inventing intermediate and advanced apps with more complex logic. The Designer runs from the browser, and the Blocks Editor runs from Java; however, they are linked. Therefore, even when you close your Blocks Editor window, all the information in the Blocks Editor is stored in the Designer. 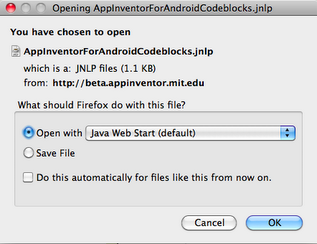 When you click the "Open the Blocks Editor" button, a new .jnlp file is downloaded to your computer, and you need to open the file again. When a new Blocks Editor opens, it will contain all the blocks you programmed before you closed the Blocks Editor. As you build your app, you can do "live testing" on an emulator or an Android device. If you have an Android tablet or phone that you want to use while you develop apps, click 4A below. If you do not have an Android device, you can still see your app as you develop it, but with an on-screen "emulator" that comes with App Inventor (you've already installed it when you installed App Inventor). To build with the emulator, click 4B below. Set up either an Android device or the Android emulator so that App Inventor can connect to it and show your app "live" while you build it.